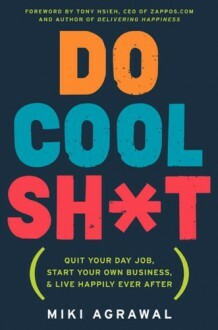 In Do Cool Sh*t, serial social entrepreneur, angel investor, and all-around cool sh*t–doer Miki Agrawal shows how to start a successful company—from brainstorming to raising money to getting press without any connections—all while having a meaningful life! With zero experience and no capital, Miki Agrawal opened WILD, a farm-to-table pizzeria in New York City and Las Vegas, partnered up in a children's multimedia company called Super Sprowtz, and launched a patented high-tech underwear business called THINX. Miki has seen significant growth in her businesses. She pulls back the curtain of how you can live out loud, honor your hunches, and leave nothing on the table.Whether you’re a student with big aspirations or an experienced professional looking for new opportunities, Do Cool Sh*t will open your eyes, make you laugh, and give you the confidence to quit your day job, start your own business, and live happily ever after.Do Cool Sh*t features a foreword by Tony Hsieh, the founder of Zappos.